Every once in a while, a book or movie just so blows me away that I am tempted to write a one-sentence review: "You must read this book/see this movie!" That's the case with Arrival, a movie my husband and I watched Saturday night and that I have wanted to see ever since its release to theaters last November. It more than lived up to my high expectations. Arrival focuses on a linguist named Louise Banks, played wonderfully by Amy Adams, who lives by herself and teaches at a university. As the movie opens, we see her at home and at school, with a voice-over addressed to her daughter about beginnings and endings while we see images of her with her daughter, from her birth to her premature death from an incurable disease as a young woman. On this day, though, Louise doesn't even get to begin her class on languages because a worldwide crisis has occurred that has the attention not only of her students but of everyone else on the globe. Twelve identical-looking alien ships have arrived on Earth in various, wide-ranging locations. They are just hanging there, in mid-air just above the Earth's surface, with the whole world wondering what they want and why they are here. Colonel Weber, played by Forest Whitaker, comes to Louise's office. He's familiar with her talents in linguistics because she previously worked on a military project with him, helping to translate in a difficult situation. He's come to her now because the U.S. military is looking for a linguistics expert to try to communicate with the aliens and find out what they want from humans. She quickly packs a bag and is raced to the site of the alien ship, in Montana. There, she is joined by Ian Donnelly, played by Jeremy Renner, a theoretical physicist. Each of them is given a team of specialists to guide, and the pair are quickly taken to the alien ship to "meet" their visitors up close. I won't give away any more because this movie is filled with fascinating, breath-taking twists and turns. Suffice it to say that, as you might expect, the aliens have an entirely different way of communicating than humans do, and learning to converse with them is a serious challenge. Adams, Renner, and Whitaker are all excellent in this film, and it is filled with suspense, as the scientists race against time. As a science fiction movie, Arrival is wonderful, with truly creative and unique aliens and alien technology and language. But that is only the tip of the iceberg. This is mainly a movie about humans and about communication. As Louise and Ian struggle to communicate with the aliens, all kinds of miscommunications occur between the humans located around the globe, all working on the same project. In addition, Arrival delves deep into issues of memory, time, and what it means to be human. Toward the end, you encounter some truly mind-bending surprises that are wonderfully thought-provoking - something I always enjoy in a movie. I absolutely loved this unique and thoughtful movie that is also suspenseful, and my husband did, too. I was disappointed that our DVD didn't contain any extras because I wasn't ready to leave this world, but I later read that you should patiently wait after the end of the movie because there is a "making of" documentary that rolls after the credits. I wish I'd known that before! I could watch the whole movie over again today. 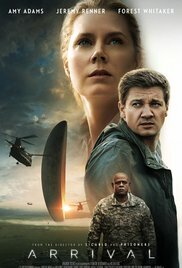 Arrival is now out on DVD (we rented from Redbox) and is available from Amazon to rent for just $3.99 (or you can purchase the DVD).